My husband often gives me a hard time that once I find something I love, I'm a complete addict. Of course, I would fervently deny that I have, in any way, an addictive personality. I have, however, come to realize that he's dead right. Did you hear that my love? You were right. I was wrong. I cannot deny it any longer, when I find something fabulous, I am a woman on a mission and I cannot be stopped. 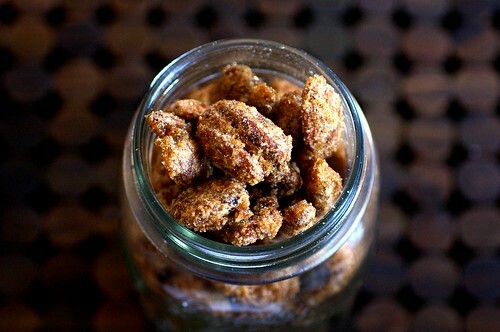 So when I found this Texas-themed honky-tonk Sugar-and-Spice Candied Nuts recipe, I knew I was in trouble. They are, as accurately described on the Smitten Kitchen blog: dangerous. Read it again and believe it. I'm inclined to think it's more of the latter! So, instead of using merely pecans and almonds, I went all out and used a nut mix which also included hazelnuts, brazil nuts, and cashews. They were sinfully easy to prep and bake and a mason jar full of 'em will make quite the holiday gift. They're sweet, crispy, and have just the right amount of kick. They are delicious with a beer and the game and will be terrific while mingling at the New Year's Eve party. Often, I'm torn between sharing a recipe I love by shouting it from a mountain-top and guarding it with my life because I want to keep the fame that automatically follows the smile that sweeps across your face. But these nuts need to be shared. Let's face it, it's candied nuts, you could probably figure it out! Preheat oven to 300 degrees. Mix sugars, salt, cayenne, and cinnamon, making sure there are no lumps; set aside. Beat egg white and water until frothy but not stiff. Add walnuts, and stir to coat evenly. Sprinkle nuts with sugar mixture, and toss until evenly coated. Spread sugared nuts in a single layer on a cookie sheet fitted with parchment paper. Bake for 30 minutes, stirring occasionally. Remove from oven, and separate nuts as they cool. When completely cool, pour the nuts into a bowl, breaking up any that stick together. I dare you to put these out at your next party. They will disappear before your eyes and you'll be the talk of the game. As for my newest addiction, I blame my friend. She introduced me to the Smitten Kitchen Blog and I'm hooked. My Tuesday night was filled with not only nuts, but cookies and bars too. Yes, I made three delightful goodies, all inspired by Smitten Kitchen. But I couldn't possibly give away the other two recipes now... you'll have to wait for the next blog!